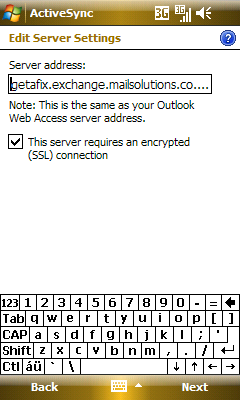 This tutorial explains how to setup your Windows Mobile Phone with your Webvault Microsoft Exchange email service. 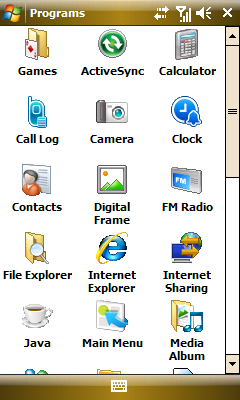 NOTE: Your windows mobile device will access the exchange server via the internet. Please make sure you have a suitable internet data plan attached to your mobile service, in order to access your email and exchange services. Webvault is not responsible for mobile data charges relating to the use of Microsoft Exchange on your mobile device. 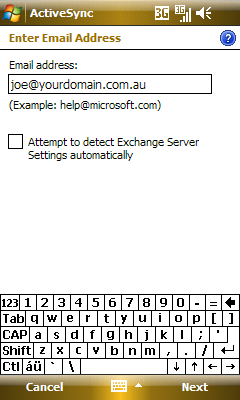 Type in the exchange server address exactly as getafix.exchange.mailsolutions.com.au If you make a spelling mistake, your device will NOT be able to connect. 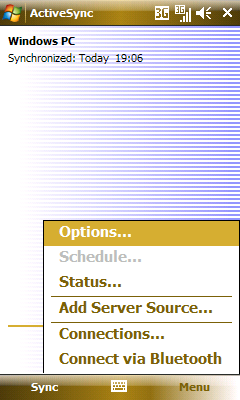 You must Tick the This server requires an encrypted (SSL) connection checkbox. 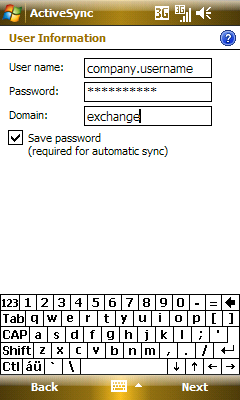 Enter your exchange username and password as shown. 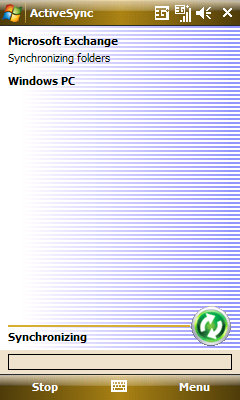 These are the same login credentials you use to access How to Use Microsoft Outlook Web Access 2007, as well as Microsoft Outlook. Enter the Domain as exchange in lowercase as shown. 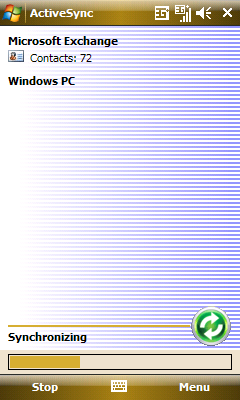 You must type this exactly or your device will NOT be able to connect. On the Server Settings page, tick the items that you want your device to synchronise. 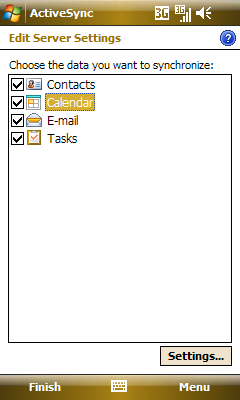 If you only want to sychronise email and contacts, then only tick these items. To optionally change the sychronisation settings for each item, highly that option and then press the Settings button. 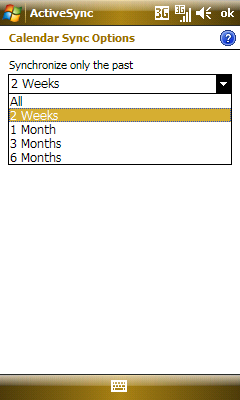 The synchronisation settings for your calendar will look like the following. We recommend you choose a reasonable time frame like 2 weeks or 1 month, so that your device will take less time to sychronise with exchange. Click the OK button in the top right hand corner once you have finished editing your settings. 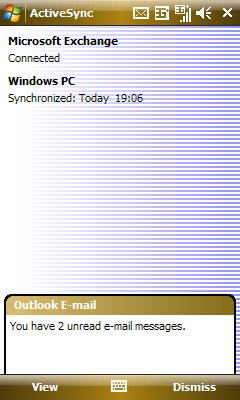 The synchronisation settings for your email will look like the following. We recommend you only download the last few days worth of email. 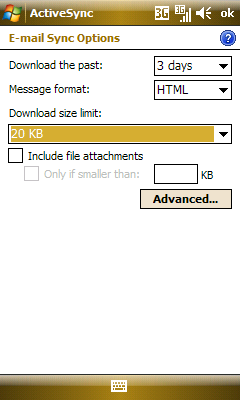 You can change the download size limit to approximately 20KB if you wish to ensure your device downloads the entire email text. The download size limit will affect the amount of data your device will transmit and the time it takes to sychronise your email. We do not recommend that you Include file attachments, these cant be optionally downloaded when you open the email on your device. Click the Finish option on the left hand side of the Edit Server Settings screen to finish setting up your mobile device with Microsoft Exchange. 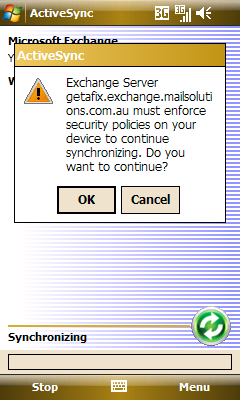 Your device should now try and sychronise with the Exchange Server as follows. The first time your device sychronises it make take several minutes or more to download all of your data. If your device asks to enforce security policies click OK. The sychronisation process will then continue. Once the sychronisation process is complete, you may receive an message than you have new email, which you can view within the Outlook E-mail application on your device. You can change the times and days that your device will sychronise with Microsoft Exchange by editing your ActiveSync options. 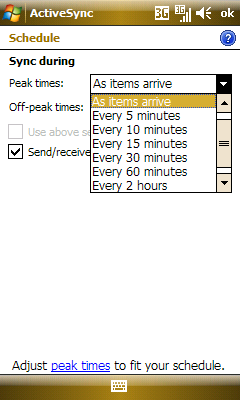 You can change the frequency that your device checks for new email during peak times and off-peak times. We do not recommend that you check for new email any more frequently than every 10 or 15 minutes, every 30 or 60 minutes may be ideal if it still suits your requirements. The more your mobile device uses a wireless or mobile network to access the exchange server, the less battery life you will maintain between charges. 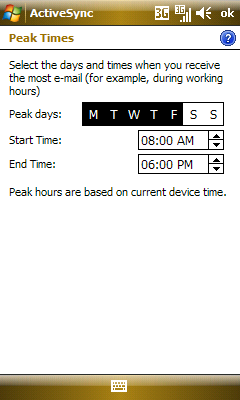 To change the parameters for what your device considers peak and off-peak times select Adjust peak times to fit your schedule at the bottom. 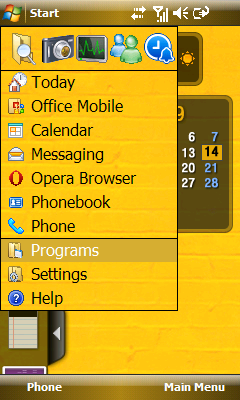 Click OK when you are finished editing your ActiveSync options.